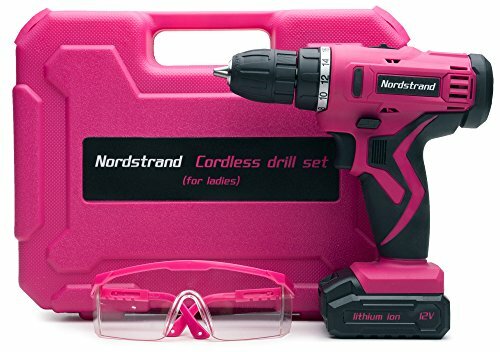 Created to be a great all-round tool for home use, the new Nordstrand Cordless Drill Driver Kit now comes with a bright pink finish. Designed with women in mind, this Nordstrand pink drill is lightweight at just 2.4lb and has a soft, comfortable grip. The chassis is slimmer and lighter than many on the market, making it easier to hold if you have smaller hands or a slight build. It also features an extension bar, safety glasses and a bright pink storage case. Learning to do your own DIY and basic household repairs is essential for empowered women. This Nordstrand drill is an ideal gift for your mom, daughter, or an independent friend. Why wait for a contractor to be free or your spouse to their grubby tools out and get round to your to-do list when you can tackle the jobs yourself? This high quality set is ideal for hanging pictures, assembling or repairing furniture, tightening screws and many other DIY and craft projects. The integrated front lamp lights up your workspace, saving you from needing extra lighting in tight spaces. This pink Nordstrand drill set is designed to be used with a wide range of materials, from drilling holes in wood or metal to driving in a screw. The drill has a reverse switch trigger, so you can easily change the direction the drill is turning. It has 18 torque settings, which let you adjust the speed and power of the drill to suit the circumstances. The kit includes 6 bits so you can use the drill as an electric screwdriver and 6 drill bits in 1/16 to 1/4in. The 12V lithium ion battery is quick to charge, taking just a few hours. Fully charged, it can run for over 30 minutes at a full load. DESIGNED FOR WOMEN Only 2.4lb and with a soft, comfortable grip, the Nordstrand Cordless Drill is designed for smaller, slighter people. The set packs away into bright pink carry case which makes the whole kit easy to take wherever you need to go. 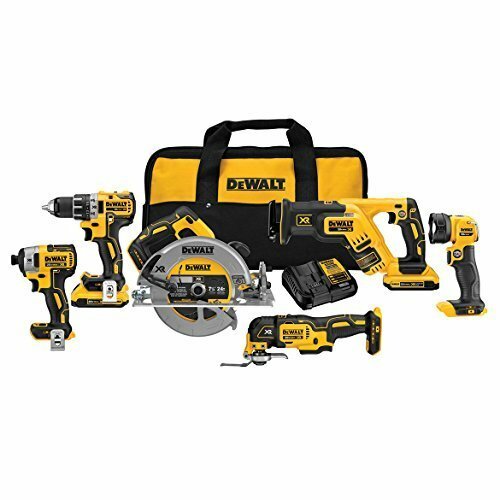 FULL STARTER SET INCLUDED As well as the drill, battery pack and charger, the set includes six most commonly used bits so you can use the drill as an electric screwdriver. It also has 6 drills in 1/16in to 1/4in sizes, extension bar and pink safety glasses. IDEAL GIFT FOR MOMS & DAUGHTERS Learning how to do basic DIY and household repairs is an essential step for all empowered ladies. The set makes a great gift for house warmings, Christmas, Mother's Day or birthdays as it can be used for a wide range of projects. STAND OUT IN STYLE The bright pink finish on this drill set makes it easy to find and easy to reclaim if someone borrows your tools. Stand out from the drab green crowd with this funky-looking and highly effective set. MAKES DOING YOUR OWN DIY EASY From hanging pictures to building furniture and craft projects to repairing a bike, this Nordstrand Cordless Drill Kit makes it easy. The front light lets you see what you're working on while the reverse switch trigger lets you change direction in an instant. 2 IN 1 FUNCTIONS - Screwdriving, drilling in wood, metal and masonry. TEST RESULT of Drilling capacity 30mm(Wood) 13mm(Metal) 10mm(Masonry). 30MIN RECHARGEABLE BATTERIES - 2 Batteries Replaceable 2.0Ah Li-ion batteries with large capacity and longer battery life. 4A current charging takes only half an hour to complete the charging process. 2 SPEED GEARBOX - With two-speed adjustment (0-450 rpm and 0-1700 rpm) and 60Nm max torque, it can be widely used for screws and various types of drilling. 24+1 TORQUE - Our electric drill has 24 clutch settings, which would be plenty for most jobs you encounter around the house. The clutch settings determine the amount of torque you get when you drill. RICH ACCESSORIES - 1 * TECCPO Cordless Drill (20V), 1 * Extension Rod (60mm), 5 * Screwdriver Bits (50mm), 15 * Screwdriver Bits (25mm), 1 * Nut Bit Adapter, 7 * Drills, 1 * Flexible Shaft, 1 * storage bag, 1 * belt buckles, 2 * battery, 1 * charger, 1 * user manual, 1 * warranty card. The BLACK+DECKER BDCK502C1 GoPak 4-Tool Combo Kit features all the right tools for your on-the-go DIY took kit. The BCD701 Drill/Driver Drill features an 11-position clutch which prevents stripping of screws and damaging materials, along with an LED work light to help illuminate your work surface. The BCS601 Jigsaw offers tool-free blade release for quick and easy blade changes, with built in blade storage on the jigsaw for your convenience. This kit also includes a BCW201 Detail Sander that has a 3.5" triangle platen on the sander to access corners and tight spaces. Finally, the BCL101 LED Light features a 90-degree rotating head on this LED Flashlight to access hard to reach angles. These are all powered by the BCB001 2-in-1 GoPak Battery, which can power both your tools and your mobile devices; it has a 2.4A USB port output that provides fast rate charging to phones, tablets and other USB devices. The battery has 4 LED lights which visibly provides the battery state of charge, and is compact and lightweight for on-the-go portability. Backed by BLACK+DECKER'S 2 year limited warranty. 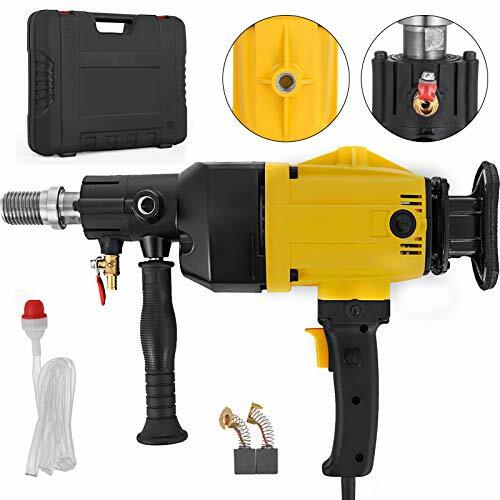 Includes: 1) BCB701 Drill/Driver, 1) BCS601 Jigsaw, 1) BCW201 Detail Sander, 1) BCL101 LED Light, 1) BCB001 GoPak Battery, 1) microUSB Charging Cable, 1) Double ended driver bit, 1) Jigsaw blade, 3) Sandpaper sheets. The DEWALT DCK684D2 20V MAX* XR 6 Tool Cordless Oscillating Multi-Tool Combo Kit contains DCD791, a cordless Drill/Driver with two-speed transmission and LED lights for working in dark spaces. The DCF887 20V MAX* XR 1/4 in. 3-Speed Cordless Impact Driver is compact for fitting in tight spaces. Three LED lights make it ideal for working in the dark. 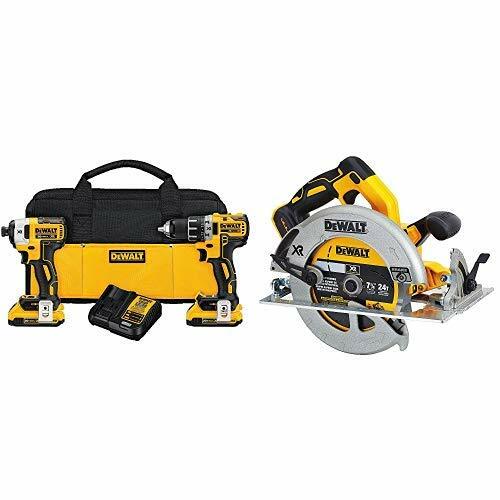 The DCS570 20V MAX* XR Cordless Circular Saw features a brushless motor which provides 5200 RPM maintaining speed under load. The DCS367 20V MAX* XR Cordless Reciprocating Saw features a compact and lightweight design to make your jobs easier. The DCS355 20V MAX* XR Cordless Oscillating Multi-Tool has a powerful brushless motor providing up to 75% more run time over a similar brushed tool. The DCL040 is a bright cordless work light that illuminates your work area with LED output of 110 lumens. 3 Year Limited Warranty, 1 Year Free Service Contract, 90 Day Money Back Guarantee. 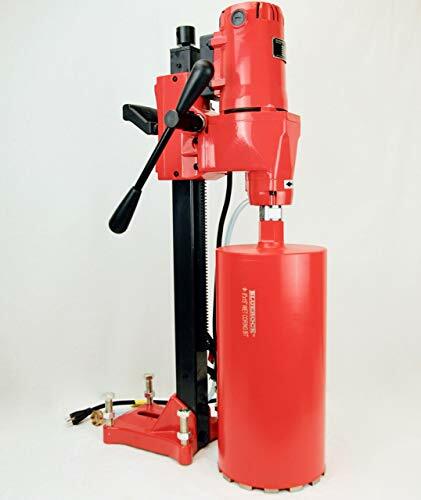 Diamond drilling machine (also known as concrete drilling machine) is a kind of new tool which drills on the reinforced concrete, masonry, and rock, ceramic and refractory, with no dust operations, high efficiency, smooth wall, Size accurate features. Core Drill Rig Applicable to construction, quality inspection, installation areas; such as equipment installation, hydropower, gas installation, civil quality inspection, airport runway, highway, railway, Railway Bridge tunnel and so on. Max Drilling Diameter: 4". Rated Voltage: 110V. Rated Frequency: 50-60Hz. Rated Input Power: 1500W. Dual Speed: 2100rpm/950rpm. Two-gear rotary speed is designed for drilling different size holes. Top gear is for smaller drill bits 1"-2". Bottom gear is for larger drill bits 2"-4". The drill is fitted with a safety clutch. 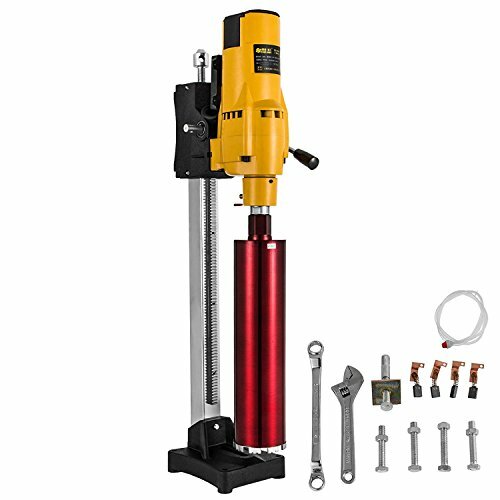 This unit is designed to be an easy portable type drill for easy hand drilling. Adaptable water spigot for "wet" drilling. Drill color is red. Comes with a durable carrying case. Level on side of the drill for precision drilling. Automatic hold down switch for comfort. Collar size is 2 23/64". NOTE: Drill bit pictured is not included. NEW BLUEROCK DIAMOND Z-1 8" CORE DRILL HIGH OUTPUT CONCRETE CORING DRILL. Specifications: Max Drilling Diameter: 8". Rated Voltage: 110V. Rated Frequency: 50-60Hz. Rated Input Power: 2400W. Speed: 750 RPM. Arbor size is 1 1/4" 7UNC. Structure and Features: The drill is fitted with a safety clutch Adaptable water spigot for "wet" drilling. Drill color is red. 2 Wrenches, 3 hex wrenches, 2 spare brushes. Adjustable Top Bolt for Binding into Ceilings. Water Spigot for use with Standard Garden Hoses. This is a brand NEW 8" portable coring drill with a stand. It's a high quality high output unit. Let us know if you have any questions before or after purchase. Drill bit pictured is not included. 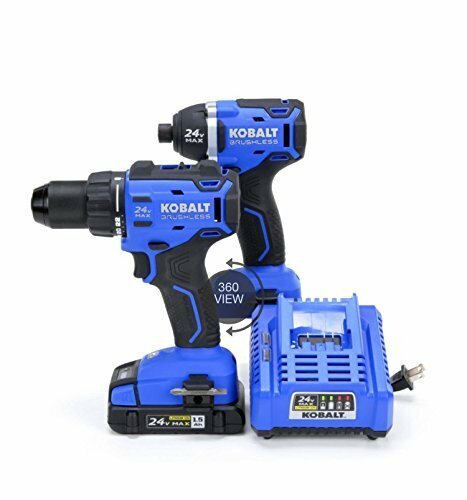 No job is too big or too small for this Kobalt power tool combo kit. The tools in the 2-piece tool kit come with brushless motors to provide you with more run time and longer motor life. 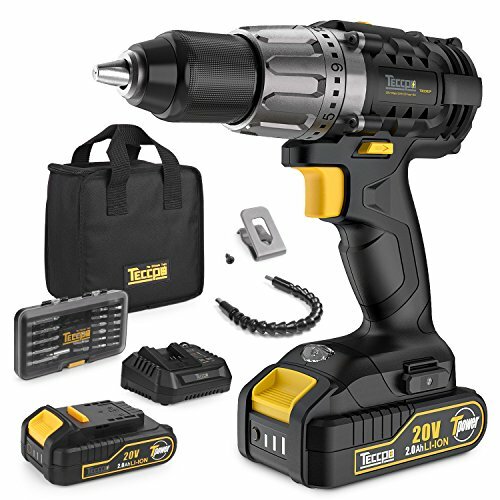 The kit comes complete with a drill/driver, impact driver, 1.5-Ah battery, and a 45-watt charger. Casaverde diamond stond dry core bit fit on a high-speed angle grinder. It provides the best drilling performance and can drill through the toughest granite or engineered stone countertop at the job site without using water. Not only is this convenient but it also increases productivity by cutting down on the amount of clean up needed when using water. 1. Side vacuum brazed protection. Designed for dry drilling granite,marble,tile, brick and ceramics. Matching with hand-held machine. T type turbo segment design. Dry drilling for stone, wet using will greatly prolong the segment life. The Handheld diamond core drill rig is designed for wet or dry drilling. 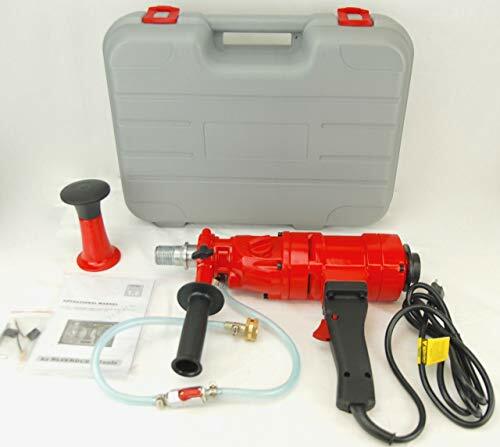 This drill can be used on brick, stone, reinforced concrete, ceramic, and fireproof materials. Maximum drilling range in brick is 6 in. Drill features quick connect water valve with shut off. Dimensions:21.7" x 12.6" x 17.7"
Steel Dragon Tools 5 in. (127 mm) x 6 in. 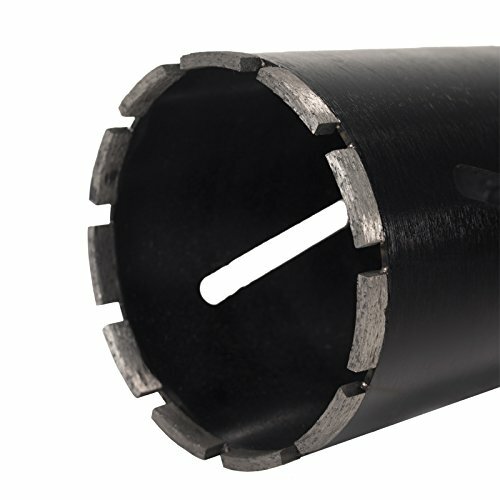 Dry Diamond Laser Welded Masonry Core Drill Bit. For use on block, brick, concrete, and other materials. 5 in. x 6 in. dry core drill bit 13/16-inch female threads. 10 mm laser-welded split segments for improved operating life. Drilling Depth: 6 in. Barrel Height: 6-1/4 in. Steel Dragon Tools diamond core drill bits have a one (1) year warranty against manufacturer defect. Factory conforms to ISO-9001-2000 Quality Control Systems and ISO-14001-2004 Environmental Systems. Bit has 13/16-inch female threads. 10 mm segment height for improved operating life. For use on block, brick, concrete, and other materials. 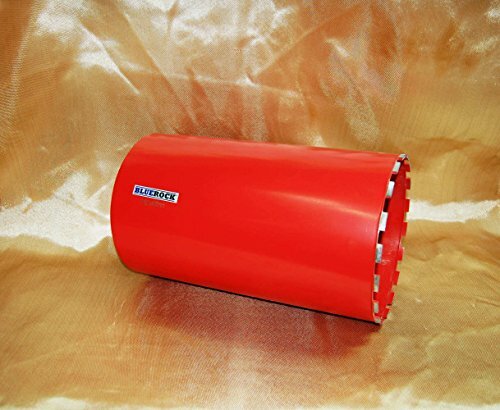 NEW - 1" - 6" BLUEROCK TOOLS DIAMOND WET CORING BIT FOR CORE DRILL - NEW Up for sale is a set of 1", 2", 3", 4", 5", and 6". WET coring bits for core drilling. Overall Length: 17" Approximate Inside Barrel Depth: 14.5" Approximate Thread Type: Industry Standard 1 1/4" (Directly fits our BLUEROCK Z-1 Core Drills) Note to buyers: Concrete coring bits are considered a consumable part. Bit life varies based on many factors including; material type, material density, depth of cut, hole diameter, drilling speed, wet/dry drilling and operator experience. As such, it is extremely difficult for BLUEROCK Tools to assess individual projects and speak to how long a bit will last before it needs to be replaced. We consider these core bits to be mid-grade in their performance but sold at a low-grade price point. Our customers tend to consider these bits to be a better value compared to high-grade bits that are a lot more expensive. We often hear that even though high-grade bits may last twice as long, they cost four times the price and they are happy buying our bits and getting the same amount of feet cut for half the price. Wet type concrete coring bits are NOT designed to cut all types of rock. They are primarily designed to cut concrete. Certain types of rock can be cut, but it will limit the bit life. The decision to use these bits on materials that they are not primarily designed for will be done at the risk of the user and not covered under our standard business policy. 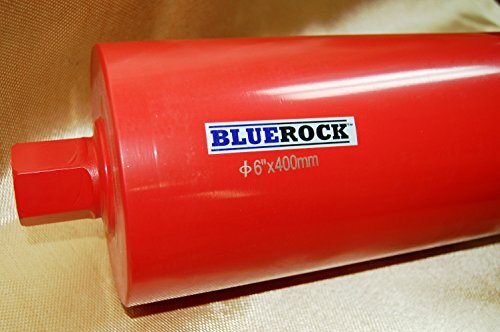 NEW - 10" BLUEROCK TOOLS DIAMOND WET CORING BIT FOR CORE DRILLING. Outside Bit Diameter: 10" Overall Length: 17" Approximate Inside Barrel Depth: 14.5" Approximate Thread Type: Industry Standard 1 1/4" (Directly fits our BLUEROCK Z-1 Core Drills) Note to buyers: Concrete coring bits are considered a consumable part. Bit life varies based on many factors including; material type, material density, depth of cut, hole diameter, drilling speed, wet/dry drilling and operator experience. As such, it is extremely difficult for BLUEROCK Tools to assess individual projects and speak to how long a bit will last before it needs to be replaced. We consider these core bits to be mid-grade in their performance but sold at a low-grade price point. Our customers tend to consider these bits to be a better value compared to high-grade bits that are a lot more expensive. We often hear that even though high-grade bits may last twice as long, they cost four times the price and they are happy buying our bits and getting the same amount of feet cut for half the price. Wet type concrete coring bits are NOT designed to cut all types of rock. They are primarily designed to cut concrete. Certain types of rock can be cut, but it will limit the bit life. The decision to use these bits on materials that they are not primarily designed for will be done at the risk of the user and not covered under our standard business policy. 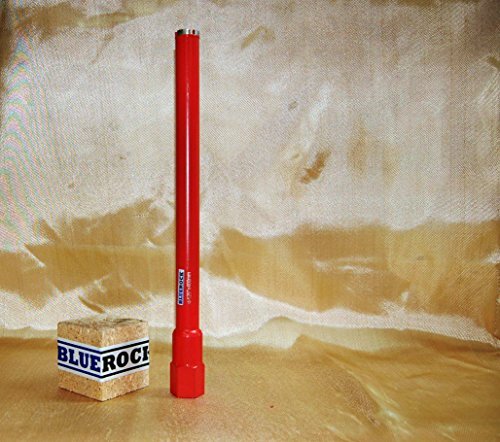 NEW - 6" BLUEROCK TOOLS DIAMOND WET CORING BIT FOR CORE DRILL. Outside Bit Diameter: 6" Overall Length: 17" Approximate Inside Barrel Depth: 14.5" Approximate Thread Type: Industry Standard 1 1/4" (Directly fits our BLUEROCK Z-1 Core Drills) Note to buyers: Concrete coring bits are considered a consumable part. Bit life varies based on many factors including; material type, material density, depth of cut, hole diameter, drilling speed, wet/dry drilling and operator experience. As such, it is extremely difficult for BLUEROCK Tools to assess individual projects and speak to how long a bit will last before it needs to be replaced. We consider these core bits to be mid-grade in their performance but sold at a low-grade price point. Our customers tend to consider these bits to be a better value compared to high-grade bits that are a lot more expensive. We often hear that even though high-grade bits may last twice as long, they cost four times the price and they are happy buying our bits and getting the same amount of feet cut for half the price. Wet type concrete coring bits are NOT designed to cut all types of rock. They are primarily designed to cut concrete. Certain types of rock can be cut, but it will limit the bit life. The decision to use these bits on materials that they are not primarily designed for will be done at the risk of the user and not covered under our standard business policy. 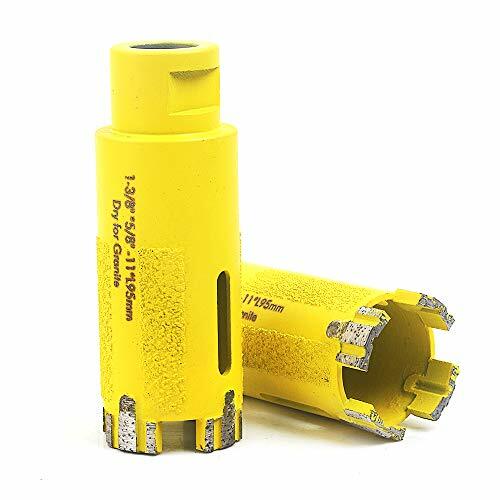 NEW - 1.25" BLUEROCK TOOLS DIAMOND WET CORING BIT FOR CORE DRILL Outside Bit Diameter: 1.25" Overall Length: 17" Approximate Inside Barrel Depth: 14.5" Approximate Thread Type: Industry Standard 1 1/4" (Directly fits our BLUEROCK Z-1 Core Drills) Note to buyers: Concrete coring bits are considered a consumable part. Bit life varies based on many factors including; material type, material density, depth of cut, hole diameter, drilling speed, wet/dry drilling and operator experience. As such, it is extremely difficult for BLUEROCK Tools to assess individual projects and speak to how long a bit will last before it needs to be replaced. We consider these core bits to be mid-grade in their performance but sold at a low-grade price point. Our customers tend to consider these bits to be a better value compared to high-grade bits that are a lot more expensive. We often hear that even though high-grade bits may last twice as long, they cost four times the price and they are happy buying our bits and getting the same amount of feet cut for half the price. Wet type concrete coring bits are NOT designed to cut all types of rock. They are primarily designed to cut concrete. Certain types of rock can be cut, but it will limit the bit life. The decision to use these bits on materials that they are not primarily designed for will be done at the risk of the user and not covered under our standard business policy. Seriously Pink Tools are smaller, lighter and more comfortable in a woman's hand, however, they are "serious" tools with features geared toward women. Tools hand-picked by women, for women! 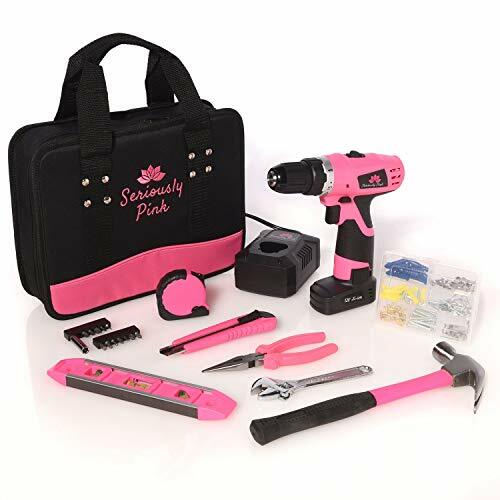 The Seriously Pink 12v Lithium Ion Drill/Driver 121pc kit is the ultimate essential kit for women who are handy around the house or for those who would like to become handy! 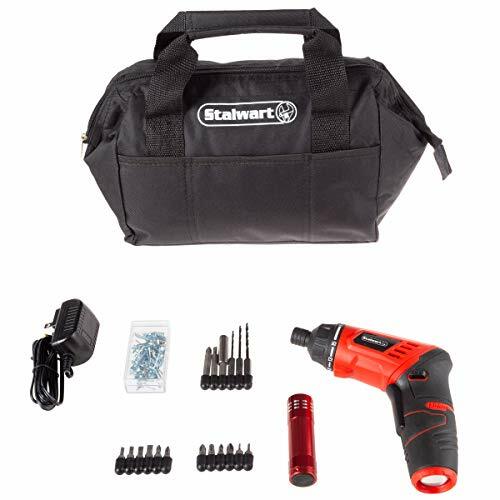 The kit contains a 12v lithium ion two variable speed drill and 6 of the most commonly used hand tools for jobs around the house plus a 101 pc hardware kit and 12pc driver bit set with the most commonly used screwdriver bits and magnetic bit extender. All tools were chosen with women in mind, gorgeous but light, comfortable and useable! Hang pictures & shelves, repair and put furniture together and much more! Included is a beautiful black and hot pink tote to keep all your tools together in one place! The 12v 2 variable speed drill features a battery pack with bottom foot which enables the tool to stand independently. Drill/Driver is light and ergonomic with rubber overmold on grip. Fast charger - charges in 50 minutes or less and lets you know when the battery is charged and ready to go! Kit includes: 12-25 mm bits, 3 drill bits, 1 magnetic bit holder, 1 flashlight, 3.6V Lithium drill, battery charger, bag, 79 fasteners. important: Avoid buying counterfeit products and Transactions with unauthorized sellers.&Nbsp; Look for our logo on the packaging for every one of our products.&Nbsp; Stalwart is a registered trademark protected by U.S. Trademark law and will be vigorously defended. Keyless chuck- this drill comes equipped with a 1/4" keyless chuck for fast and convenient bit and driver installation or removal. Simply twist the chuck ring either direction to loosen or tighten the grip and insert or remove the bit. Carrying case- The entire kit comes in a 600D oxford cloth bag. The opening of the bag opens wide for easy access to your drill and bits. It's great to keep in your truck, RV or Garage. 101 Piece accessory Kit- take on any DIY or household project with this extensive accessory Kit. It includes screwdriver bits, drill bits and fasteners. Lithium Ion battery- the included Lithium Ion battery holds a charge up to 18 months. This allows you to have a reliable charge for longer, ensuring your drill won't Die in the middle of a project. Product details- battery: 3.6 volt Lithium Ion. 15+1 torque settings. Carrying case included. 101 pieces. Color: Black, Red. Drill dimensions: L 7 x W 2 X H 7 angled. Extends: 7 x 9.25. bag dimensions: L 11 x W 7 x H 8. opening Dimensions: 12 x 8 x 8. 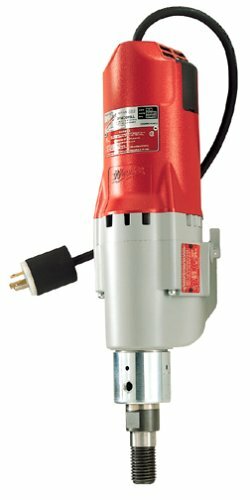 DRILL DMD 600/1200 20A CL. The product is easy to use. The product is durable. The product is manufactured in United States. 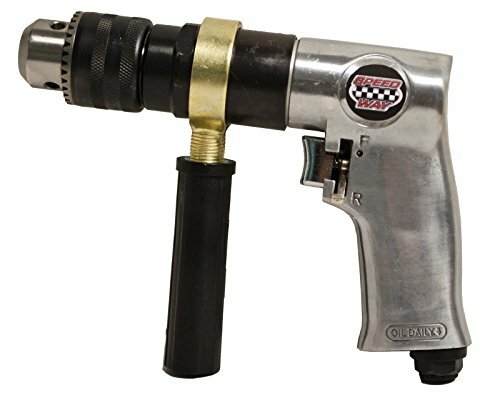 This Speedway 1/2" Reversible Air Drill features variable speed triggers for positive control with pistol grip handle Equipped with 1/2"Jacobs Chuck.